Bread and salt is associated in many central and eastern European cultures with hospitality. 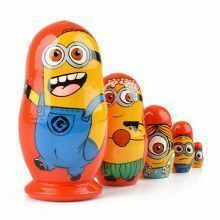 Bread being the most respected food, whereas salt is associated with long friendship.This Ukrainian hospitality nesting doll represents this tradition. 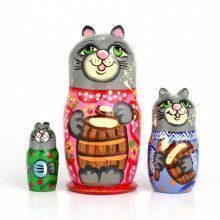 It is hand-carved from birch wood and hand painted by Ukrainian artists. 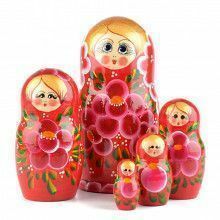 This doll depicts personalities of a traditional Ukrainian family throughout. The bright and vibrant colors of this doll really make it stand out. Bread and salt is associated in Russian culture with hospitality, bread being the most respected food, whereas salt is associated with long friendship. When important, respected, or admired guests arrive, they are presented with a loaf of bread placed on a rushnik (embroidered towel). A salt holder or a salt cellar is placed on the top of the bread loaf or secured in a hole on the top of the loaf. 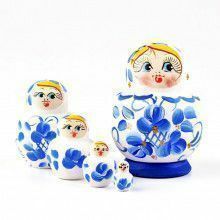 In modern Russia, on official occasions, the "bread and salt" is presented by young women dressed in national costumes (e.g., sarafan and kokoshnik).